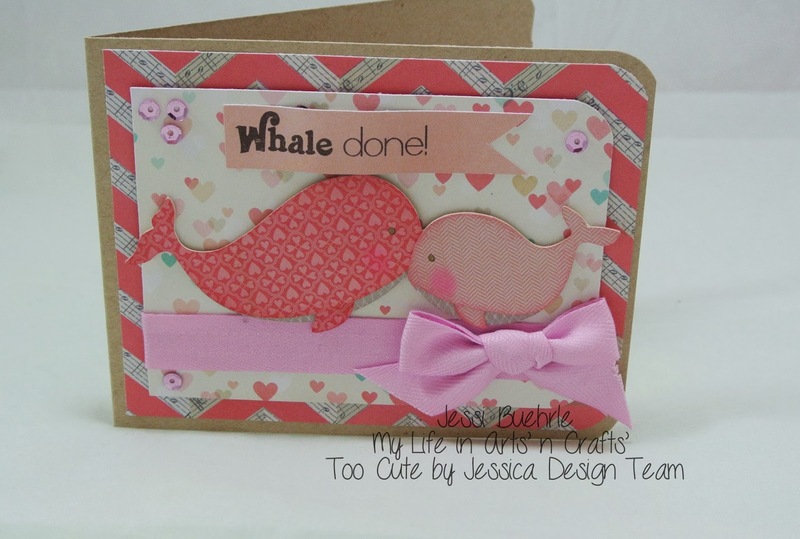 Hey everyone it’s Monday and that means a project featuring Too Cute by Jessica’s designs. Look at me go… I’ve only missed one day so far…ok ok it’s only been a week so far but it’s a start lol. Sentiment- Scrappy Mom’s stamps "Amusing Animals"
Using papers from the “Love Notes” collection from Crate Paper I made this whale-done card. I wanted to see more of the pink chevron paper so the inner most layer is 3.75” by 5” while the chevron paper is 4” by 5.25”. I rounded the corners of the right hand side of all the papers and base using the we r memory keeper’s corner chomped. ooooooo guess what I am a guest designer over on the Craft Warehouse Blog.